Travel and lifestyle content ready for commission. Australia's top travel and lifestyle writers and photographers. The result of a combined total of more than 200 years of experience in the professions of Travel Writing and Travel Photography, the new Global Travel Writers E-book Travel Writing and Travel Photography - from Dreams to Hard Reality contains material that you just will not find anywhere else. The twelve contributors to this E-book take you through the processes of digging out a story idea; using the services of national tourism offices to arrange "famil" trips and to help research a story; pitching to editors; and much much more. The chapter on “New Media” contains exclusive material and advice on the latest Neo-Linguistic Programming (NLP) techniques that you can use to enhance your writing’s appeal to editors and, through them, to readers. And because photography is so important, in this E-book we have devoted two comprehensive chapters to travel photography for a digital age. 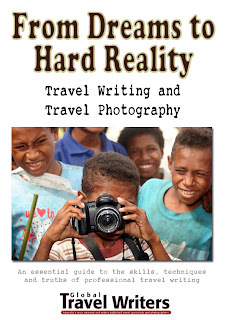 The 56-page E-book Travel Writing and Travel Photography - from Dreams to Hard Reality is available for immediate download at a price of just USD 17.95 or AUD 19.95. Buy now! We guarantee you will not be disappointed. This is an incredible article. These tips will assist a considerable measure with clicking incredible pictures with your camera. I profoundly suggest leasing lenses instead of purchasing if you need something explicit for one trek. In any case, when the time comes, neither of us has the cash to drop on a super cool zooming focal point that we wouldn't use in our regular work at any rate. Leasing comprehends that issue perfectly. I am offering it to my camera club individuals.